I have a ASUS P5W DH Deluxe motherboard with a Intel E6600 CPU overclocked from 2.4 GHz to 3.1 GHz and this was until yesterday cooled by an Arctic Cooling Freezer 7 Pro. The Freezer was a great cooler with a lot value for the money as it was really cheap and a better performer than the stock intel cooler. However when the CPU was working hard the fan speed rose from a whisper quite 800 RPM to a quite noisy 2500 RPM. This was getting on my nerve as gaming and everything else CPU intensive became something I did wearing headphones. After researching CPU coolers for a while it became clear the Noctua was the way to go when it came to low noise performance. NH-U12P is quite massive with weight of 770 grams (fan included) and the dimensions (HWD) 158x126x95 mm. It makes my ATX motherboard apear small. The NH-U12P is a tower cooler and comes with a NF-P12 fan. According to Noctua and several review sites this fan is very quite due to the specially designed blades which break the vortices in the slip streams and create a more wider range of noise frequencies making the noise of fan seem less intrusive. I can’t really compare this fan with other high-end fans but I am impressed with the low noise. 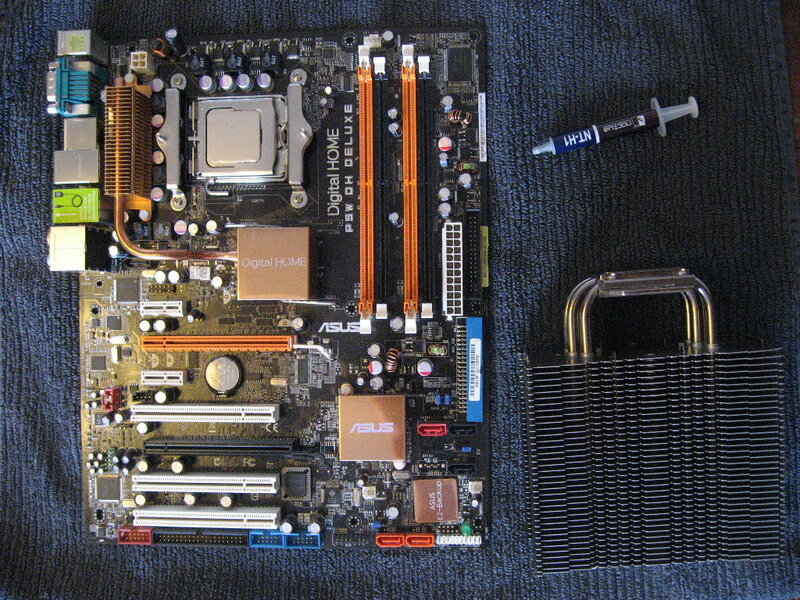 The fan has 40mm clearance beneath the the tower and did not interfere with the chipset coolers or the ram blocks. The package comes with some nice extras such as a quite long screwdriver and some of Noctua’s own high-quality thermal paste NT-H1. Even better there was to additional cables to modify the speed of the fan. The stock speed is 1300 RPM but the two cables allow the fan to rotate at 1100 and 900 RPM. The stock speed gave a silent hiss so I changed to the 1100 cable and the result is a silent but cool system. Most reviews are very positive but all seem to agree on one thing that the price tag is hefty – 500 DKK (100 $). It’s clearly one the best performing and most quite CPU coolers out there, so despite the price I am happy with the purchase. There is no doubt the Noctua NH-U12P has joined the ranks of the best performing coolers ever tested at AnandTech. With two NF-12P fans in push-pull, it turns in the best cooling results at the highest overclocks we have ever seen. 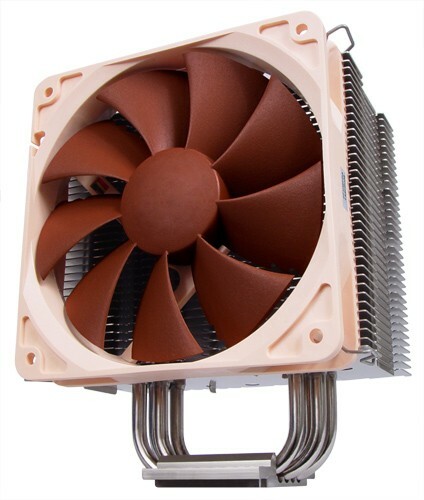 We can also recommend the Noctua NF-P12 fan for performance plus silence on the Thermalright. If you want a complete cooling kit balanced for performance with silence, the NH-U12P is an excellent choice. The Noctua NH-U12P performs very well, even against some of the top-rated heatsinks on the market. When I pulled the cooler out of the box I was initially impressed with build quality and then once it was in use I was highly impressed with it’s cooling ability, as well as the performance of the excellent NF-P12 fans. Add in the fact that Noctua include some top-end thermal paste and we’re onto a winner. The Noctua NH-U12P is possibly the best heatsink we’ve tested thus far, rivaling the Thermalright HR-01 Plus for the CPU cooling crown. It excels no matter how much airflow is applied. With our reference Nexus fan, its performance scaled very well as the fan speed was decreased, making it a very versatile product for silent PCs. 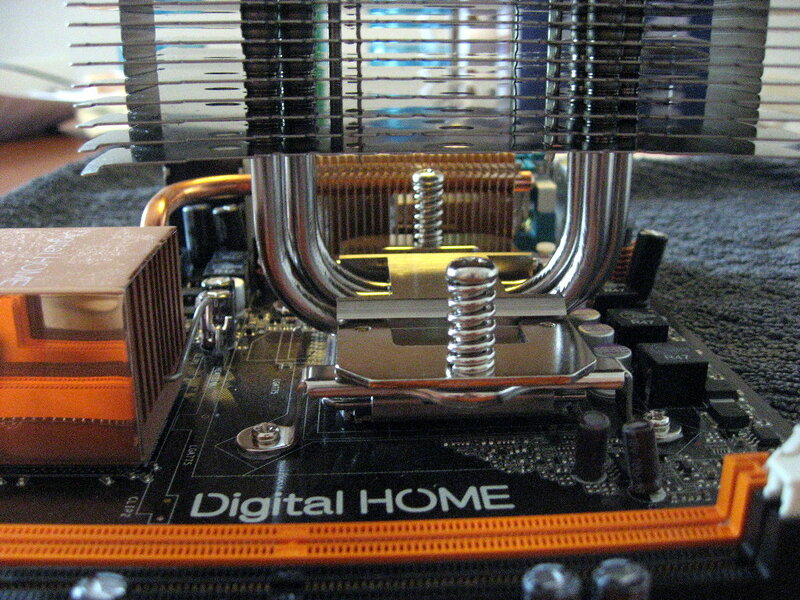 Mounting can be somewhat tedious, but getting to the back of the motherboard is a necessity for all through-the-board bolt-and-spring systems, which we feel is the best for large heavy heatsinks.